If you visit Ximending on any weekend, you’re sure to find crowds of people filling the labyrinth of endless streets. Just one MRT stop away from Taipei Main Station, Xi Men is a stop where you can find countless restaurants, shopping and fun attractions to fill up your day. From street performances to kitschy themed restaurants, here are seven things you DON’T want to miss at Ximending. What are your favorite things to do, see or eat in Ximending? Tell us in the comments! Enjoy a fairytale experience where you can sip a cup of milk tea while perched on a swing with a great window view. This cafe is known for the hundreds of dolls and stuffed animals nestled around the cafe. Drinks cost around 40-80NT. The dolls are also available for purchase. Want to enjoy your dinner served in a toilet? Most likely not under normal circumstances, but at Modern Toilet, you’ll get a dining experience you’ll never forget. The grub here is served up in dishes that resemble toilets, urinals, and bathtubs. Make sure to try their shaved ice dessert, served in fancy urinal and topped with marshmallows, jelly, cookies and of course a swirl of soft serve that has a discernable likeness. Meals range from 100-200NT. For those interested in an underwater dining experience, Shell Lover Cafe and Fish House are two spots where you can feel the cool blue of ocean waters around you as you dine. Set meals are around 200NT. As you wander the streets of Ximending, you’re bound to come across crowds circling around various street performances and art works. Just outside of of Ximen MRT stop Exit 6, multiple vendors and street entertainers are bustling busily to do their best to entertain their many spectators. Vendors are there throughout the day, but usually without a set schedule. 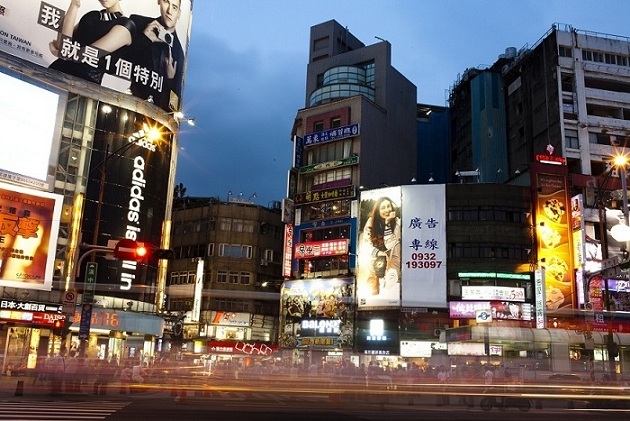 Ximending is a shopper’s paradise, with hundreds of different stores. You’ll find not only fashion boutiques, but also many novelty clothing stores, beauty shops, and much more. At the Thousand Year Products Tower, you’ll find floors of novelty shops full of one-of-a kind products that range from clothing to all sorts of fun items. Looking for beauty products? Visit one of many stores that carry a steady supply of Korean-imported beauty products and accessories. You can find many along Han Zhong and Wan Hua Streets. Check out Etude House and The Face Shop for not only beauty products for women, but also some great items for men as well. At Naughty Cat, find earrings, rings, bracelets and more for very cheap prices, starting from 50NT to 300NT. 4) All–You–Can–Eat, Drink, and Häagen-Dazs?! If all the walking around Ximending has made you hungry, eat to your heart’s content at one of the many all-you-can-eat ma la hotpot places. Ma La is one restaurant where you can eat and drink as much as you want of hot pot, beer, and even Häagen-Dazs ice cream. They are known for their spicy broth base, which contains the numbingly hot ma la spice. Lunch starts at 399NT and dinner at 450NT. Come here if you like hot pot but also want the option to grill your meat. All-you-can drink beer and Häagen-Dazs ice cream are also available. Lunch starts at 399NT and dinner at 499NT. One Taiwanese experience you can’t miss out on is KTV – the local term for singing karaoke. Ximending is home to three of the biggest karaoke chains in Taipei. If you’re looking for a more upscale venue, Party World is your place. Party World offers their customers 24-hour service along with an all-you-can-eat buffet (until midnight). Weeknight rates can range from 400NT/person for three hours, and 500-600NT/person during the weekend. If you’re looking for a more affordable alternative, Holiday is another great spot. This KTV chain is a little hidden from the main streets, but you’re sure to find crowds of locals waiting in line for a room. Three hours of singing with a buffet meal will cost you around 400NT/per person here. Students – don’t forget to bring your ID for a discount! Looking for some more unique shops? Just across the street from the Ximen MRT Exit 1 is an old building called the Red House Theater. Don’t be fooled by the antiquated exterior, the inside consists of two remodeled floors full of Taiwanese indie art shops. On weekends, you’ll also find stands filled with indie art camped right outside this theater. And if you’re really lucky, on some Sundays you might just run into a random Taiwanese pop star holding an album-signing event here! Looking for some interesting things to do that are a little different than the typical dinner, movie or shopping? Ximending offers a fun range of activities, from batting cages to ice skating rinks, that will get you up and active. On the 8th floor of the U2 Theater, you’ll find a hidden arcade filled with a shooting range, batting cages, and basketball hoops. The shooting range will cost you 100NT a round, while the batting cages are only 30NT per round. Channel your inner Michelle Kwan and cool down from the hot summer hear at the ice skating rink located right inside the Eslite building at Ximen MRT Exit 6. Prices range from 160-190NT (4 hours) on the weekdays and 220-240NT (3 hours) on the weekends. Discover places you wouldn’t find otherwise with our local experts. i adore the red house theater: i know they used to have outdoor markets at the red house last summer where artists came to sell stuff on the weekends…wonder if it’s still there~! this is really a great article! I just have one question: is there also a wide range of Western songs at party world or holiday or is it mostly Taiwanese songs?